The apartment 04 has a floor space of 46 m2 and can accommodate up to 4 people, plus zzgl. Toddler be occupied. In the apartment you will find a double bedroom and a sofa bed in the living room. The kitchen is equipped with fitted kitchen and all necessary electrical appliances. The apartment is equipped with a separate kitchen, the bathroom has a bathtub. The beach is about 5 minutes walk away. Pet are allowed. Bed linen and towels can be booked. For our little guests a cot and a high chair is available. Spend your holiday in one of the quieter resorts on the island of Usedom! make stress free vacation, this can be with us in Koserow! 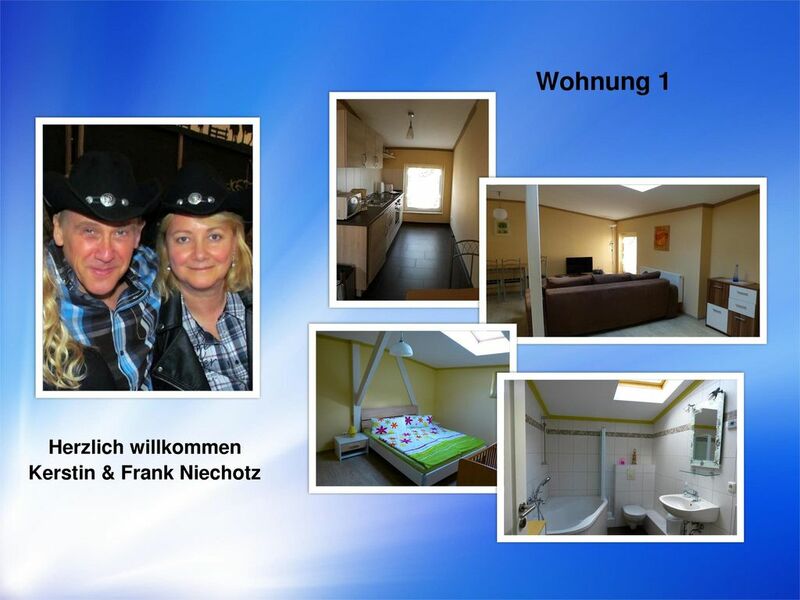 By location nearby dialysis center (800m) our apartments are also great for dialysis patients. In a few minutes you are at the sandy Baltic Sea beach. In our holiday home there are 4 apartments. Apartment 1 has a size of 57 m2, apartment 2 of 40 m2 (max 3 persons) and apartment 3 and 4 of 46 m2 each. A pretty 2-room apartment is located. For max. 4 people, plus. A toddler up to 2 years, an ideal vacation accommodation. The apartment is equipped with everything a pleasant holiday promises. The bedroom has a large double bed. Unless you have booked with the laundry package, you will find the beds already occupied before, a towel package also. If you need more towels, so you can reorder liked locally. It is also in the bedroom the possibility to set up a cot. This, as well as a high chair can be provided to you free of charge. The bed linen can be brought or booked separately. The apartment is modern furnished. It is equipped with a kitchenette and a high-quality furniture. The latter can be converted into a bed and offers enough space so that 2 more people can easily spend the night here. In the kitchen you find a cooker and a large fridge with freezer compartment, a microwave, a toaster, a kettle as well as a coffee maker. The floors in the apartment are tiled. In the bedroom, laminate is designed. If you arrive by bicycle, so you have a lockable bicycle room. It is possible to use in-house bicycles for a fee. Explore the beauty of the island through the extensive bike network! The town has enough shops, banks and a pharmacy as well as copious restaurants and nice cafes. You will also find Koserow a bicycle rental, a smokehouse as well as a playground or a miniature golf course. Within walking distance is also the stop of the Usedom - baths - path which one can explore the whole island up to Poland carfree. For young and old, big and small there is in our place the ever popular "Karls Erdbeerhof". The convenient location between Zinnowitz and the imperial baths will convince you. Here you are at a central point and are by bicycle, train or car fast here or there. If you prefer short distances and a pleasant environment, so you are in good hands here. After 600m you stand with your feet in the fine sandy Baltic. Es ist sehr gut gelegen und in einem guten Zustand die Sauberkeit lässt etwas zu wünschen übrig. Die Lage ist super, die Ausstattung Standard wobei einige Sachen eventuell erneuert werden könnten. Sehr positiv zu erwähnen sind die Fahrräder zur freien Nutzung. Wir würden die Wohnung wieder mieten und damit auch weiterempfehlen. Aufenthalt war sehr schön..Wlan zu schwach..und von der sauberkeit waren wir sehr entäuscht..mussten erstmal selber Hand anlegen um uns einigermaßen Wohlfühlen zu können..Schade das man für eine Endreinigung bezahlt wenn es sowieso nicht sauber gemacht wir..
Wir haben alles so vorgefunden wie erwartet. Die Ferienwohnung ist gut ausgestattet und es sieht alles neuwertig aus (Juni 2017). Was noch schön wäre ist wenn es freies WLAN gäbe. Die Lage in Koserow ist sehr gut, man ist wirklich schnell am Strand und kann alles zu Fuß erreichen. The apartments are located in Koserow, about 600m from the beach, close to the spa. 1 km away you will find in March at the young and old, big and small allseitsbeliebten "Charles Erdbeerhof". For dialysis patients is about 800m away a dialysis unit.